Many SDAs have written me after the September 11, 2001 WTC attack and claim this was a fulfillment of Ellen White's prophecy. This was wishful thinking on their part attempting to prove EGW as a prophet. Even the White Estate refutes the WTC attack was a fulfillment of EGW's prophecy. The White Estate reply is at the end of this topic. . . . The White Estate does not see this a [sic.] prophecy of the destruction of the WTC by Ellen White. After denying EGW had the WTC Vision . . . . In the above, Sanders thrice asserts that the White Estate denies that Ellen White predicted the events of September 11. Yet in the interest of fairness it should be pointed out that Sanders' assertion is false. In the words quoted by Sanders, the White Estate only denies that Ellen White specifically referred to a "twin-towered building." And as far as we can tell, the White Estate is correct in making such a distinction. While we can find where Ellen White predicts the burning and falling of buildings in New York City, we cannot find anywhere where she said that those buildings would be twin towers. But does it really matter? One could predict the demise of the World Trade Center without necessarily specifying that two of the seven buildings involved were "twin towers." He states that "she did not see jet planes crashing into the buildings by terrorists." But why should that matter? Perhaps his best point is, "The buildings did not consume as made of pitch," since there was a lot of debris left. But he must have overlooked the fact that she also predicted that these buildings would "fall" and be "crumbled into the dust." Such statements imply a lot of debris. Lastly, Sanders says, "The owners of the WORLD TRADE CENTER was not owed [sic.] by private persons, but the New York Port Authorities [sic.]. 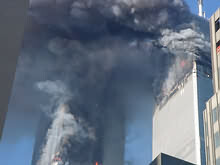 Please see "September 11: Why Did God Allow It?" for an explanation of who the owners were, and how what they did was wrong.